I always look ahead to creative new ideas, new events, and new ways to help couples enjoy great wedding receptions. As 2013 comes to a close, I wanted to take a look back on what helped focus Spencer Weddings and Entertainment towards the amazing past year. Although I’ve spoken at The Las Vegas DJ Show and am a regular contributor to The Disc Jockey News, this was the first year I made a broader approach to the service industry. In the first part of the year I presented at networking functions held by Silicon Valley NACE, Weddings of the West, and Tri-Valley Wedding Professionals. Just a few months ago I was the Bay Area Chapter of the ADJA presented me with a Service Excellence Award, in part for my educational efforts within our community. Even though we’ve been together 14 years, November marked our the 5th anniversary of our wedding. We never took a honeymoon, so going somewhere big seemed appropriate. With the help of my friend Frances Hedrick at Magical Vacations by Me, I got a fabulous package staying on the Disney Vacations property. With a meal plan and five days of park passes, we experienced the magic of all things Disney, including the Epcot International Food & Wine Festival. I observed so much that helped me rethink the kind of experience that sets one company apart from its competitors, and it has already inspired upcoming changes to the Spencer Weddings Experience. Training has always played a huge role for me. While I constantly make room for at least one of the national DJ conferences, I try to include smaller workshop training as well. Recent years have included Master of Ceremonies and various business training. Earlier in 2013, I had the privilege of returning to one of my favorites called The Entertainment Experience. This 3-day workshop and performance training for wedding entertainers opens up the power to create and tell a story that’s all about the bride and groom. This was quite a progressive year for my little company, but I have the privilege of doing something I love. With a redesigned website lingering in the rafters and bigger, better training on the horizon, I look forward to the opportunity to amaze my clients and their friends. I look forward to making new relationships along the way. I am only about halfway to the point I wanted to be when I started this company five years ago, yet at the same time I feel that it has grown in directions I never could have anticipated. With inspiration lurking around every corner, I can’t wait to see what I’ll have to say one year from now. Holiday parties serve as a great way to reward your employees and show them appreciation for all that they have done in the last year. It’s also a great way to showcase the growth of your company or organization, or server as a recap of a great year. 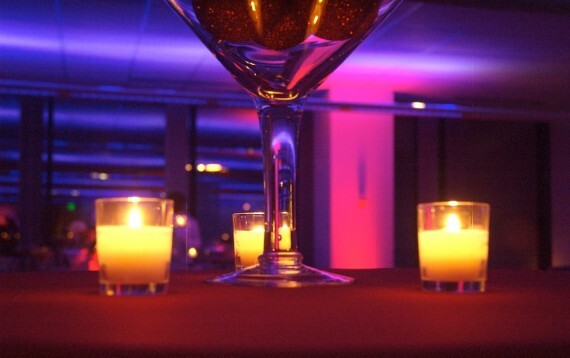 Here’s a quick list of seven steps that will help ensure that your holiday party is a success. 1. Luncheon or dinner, or something else? The first step is to determine what kind of gathering you want to have. In 2012, more than half of all holiday parties (51%) are held as a luncheon in the workplace, but an evening event isn’t far behind (38%). Bear in mind that the time of day will usually impact who can attend, the formality of the event, and the overall budget. Daytime events certainly tend to be less expensive, but going outside of the box (say a catered evening event at Bowlmor Lanes in Cupertino) could be far less expensive than a formal lunch outing via shuttle bus during work hours. With a general idea of your event in mind, now select a date and time. Over half of all corporate parties (58%) take place during the second or third week of December, usually on a Friday or Saturday. You’ll likely save a bundle of money if you can move to any other day of the week. If it’s possible to offer Friday as time off to your employees, then Thursday could work out in your favor. Don’t feel that your party must take place in December, either. Many organizations will wait until after the new year and celebrate during the first two weeks of January. Not only will this cut back on your overall budget, but it allows you to alter the aspect from a “year end” event to that of a “kick-off” to the upcoming calendar year. 3. Forming your guest list. This sounds easy, but can get tricky. Growing up, my father worked for IBM and I remember many family oriented summer and Christmas parties where spouses and children were invited. That kind of extravagance certainly carries added expenses. Daytime luncheons are likely to be employee only, but if your event in in the evening or on a weekend, extend the opportunity for employees to bring significant others or their families. They will appreciate the opportunity and you’ll start earning even greater respect and rapport. Now that you have a general idea of the kind of event you are having, as well as the guest count, you’re all set to nail down a venue and your catering. Sometimes you can get these all in one, and there’s a growing trend to start with your caterer and letting them work for you in finding a suitable venue. One example is Mike Shin at Michi’s Catering. He will help you find everything you need, and it just starts with a call for catering. Bear in mind that you may need to have multiple dates in mind for your event. This year the most popular date is Friday, December 13th. Friday the 6th and Friday the 20th are the next two most popular dates in 2013. 5. Select a theme and entertainment. The simplest holiday parties are just a gathering and a meal, but many organizations will hire entertainment for the better enjoyment of their employees and families. Placing a theme on the event will make it more memorable as well. Entertainment is not limited to DJs, but can also incorporate comedians, live bands, corporate speakers, and much more. One year in San Francisco, I saw HP bring in a 20-minute feature presentation of Cirque du Soleil. With the right budget and some imagination, anything is possible. 6. Create an entertainment itinerary. This is probably the most crucial step of the process, and doesn’t have to wait until the very end. Bringing in someone that understands Entertainment Direction and the flow of events will help ensure that your event runs as smoothly as possible. Your DJ and Master of Ceremonies (like Spencer Entertainment) should probably play a heavy hand in this, but that’s up to you. Create a natural flow that incorporates arrival time with hors d’oeuvres, mealtime, speeches by company officers, employee recognition, and sort of gift-giving or raffles, entertainment, and a way to cap off the event closure. Again, your entertainment professional will have seen enough events to work with you on an entertainment itinerary that makes sense for your event needs. I can’t stress this enough: The entire purpose of a holiday party is for the recognition of your employees and their hard work and successes over the year. Make sure that your employees feel appreciated when they leave the event. Disgruntled employees often show up trying to stick it to their company by gouging an open bar. Alleviate this by fostering pride in your company culture and celebrating with your employees. Incorporating your culture will keep it from feel contrived and insincere. Hiring entertainment, catering, and other vendors that understand and reflect your culture will convey this message too. Still stumped? Check out this list of Ways to Thank Employees this Holiday from ERC. If you are stumped, perhaps you can check in with an Entertainment Director, like Jason Spencer here at Spencer Entertainment. He’d be happy to help you get going in the right direction, and even work on your itinerary to make sure that it doesn’t feel to cramped with events. Avoid the hourlong raffle drawing in favor of shorter, quicker interactions. Call today and we’ll get you going in the right directions. Growing up in the northern suburbs of Atlanta (Marietta to be exact), my older brother and I would often dig deep into our imaginations to entertain ourselves. One such way was with LEGO. Being six years older than me, I can honestly say that I think they have been around me my entire life. If for no other reason than their inherent calling for creativity, I love them. I honestly wish I had more around my house, though my feet would probably beg to differ. 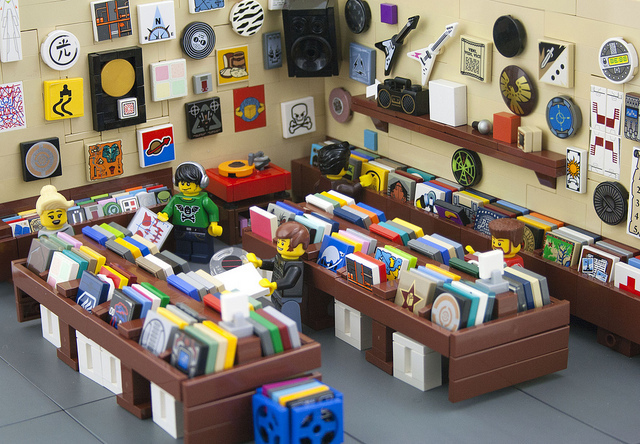 That’s why when I came across this record store made entirely out of LEGO bricks (by FLICKR user eldeem), I had a moment. One where I remember just how much fun one can have being a kid. While not nearly as cool as this scene (hey, it was the 80’s back then), my brother and I would envision ourselves as hip owners of a coin-op arcade. We had a tabletop pool table that we used as a the “event space” and would build miniature arcade machines with our bricks. However, the thing that stands out for me in this record store scene was the one other thing we did inside our miniature arcade. We always had music. Often times we’d build a little DJ booth inside. Other times we would create a stage and set up a band, complete with drum kit, guitarists, keyboardist, and an over-the-top lead singer (think Steven Tyler of Aerosmith). This was all well before I personally started playing bass guitar (that came in high school), and nearly a decade before I would even entertain the idea of becoming a DJ. Today, I entertain for couples plus their friends and families as much more than just a DJ. I get to do it nearly every weekend. For some reason I think that there was an “entertainer” seed planted a long time ago, as a little boy growing up. It’s important to remember where you come from, and to always remember how you got to where you are today. Clocking in at over 350lbs, you might not think that I’m trying to be more and more healthy — but I am. That’s why I loved it when I came across this yoga playlist from the fine folks over at One Down Dog studio on Sunset Blvd in Los Angeles. 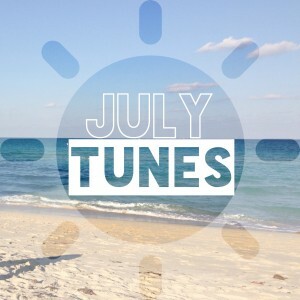 What I love about this playlist is that it’s all over. There’s some classics like Ella & Louis, disco-influence like Grouplove, and even Top 40 like We Can’t Stop by Miley Cyrus (perhaps my guilty pleasure in this list). Momentum changes all over to keep you going during a great workout. So go check out what they’ve got going on this month, and if you are in LA anytime soon, make sure to stop by One Down Dog!